Skippers Sue Miller and John Browning, along with their crew won Herbert J. Schmidt, Jr. Perpetual Trophy, which honors the late Herb Schmidt, Sonar Fleet founder. From left: Dana Schnipper, Alan Thompson, Stephanie Baas, John Browning, Sue Miller, Barbara Schmidt, Bill McCollum. While we are stuck in the middle of winter weather, with another snow storm and low temperatures predicted, it might be fun to recall those warm, sunny days last year when our sailors were out on Manhasset Bay and Long Island Sound doing all they could do to cross the finish line first—or at least in the top three. If you happen to gather at a sailor’s favorite watering spot, you most likely will hear talk of “one great mark rounding” or “our start in that race was unbelievable!” Aren’t those rose-colored memories wonderful? At least it will get us through some of the gray, cold and windy days in store for us. To aid in your journey into the past…read on for the local sailing awards from all three yacht clubs on the bay. Enjoy basking in their glory and when you next see one of the sailors mentioned below, give them a pat on the back or a compliment. But don’t forget all those skippers who are not mentioned below who were out on local water all summer long. They deserve our accolades also. 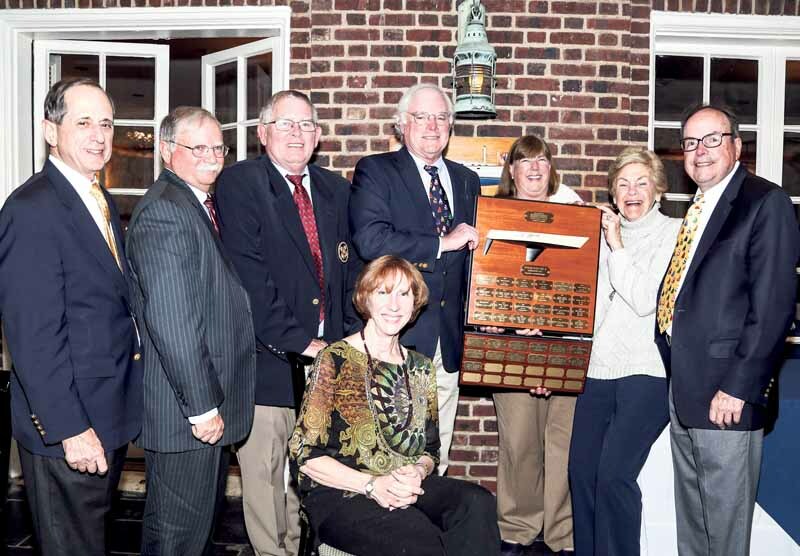 Manhasset Bay Yacht Club held their Annual Sonar Awards in the fall at a dinner on their upper terrace. The evening was well planned and the room was filled to capacity. After drinks, hors d’oeuvres, and dinner, Bill McCollum, Sonar Fleet Captain, assisted by Mary Lu Dempsey Palafox, Sonar Secretary, presented the following: 1st Championship Series, 1st Saturday Series, 1st Sunday Series: Ping!, Sue Miller/John Browning; 2nd Championship Series, 2nd Saturday Series, 2nd Sunday Series: Laurie B 2, Ron Baskind/Phillipson; 3rd Championship Series, 3rd Saturday Series, 3rd Sunday Series: Old Flame, Ed King/Bill Palafox/Mary Lu Dempsey-Palafox. 1st Crew Race: Dreadlox. 1st Long Distance Race, Whimsey, Claes Larsson. North Shore Yacht Club Awards are presented at a gala dinner dance held in the fall. 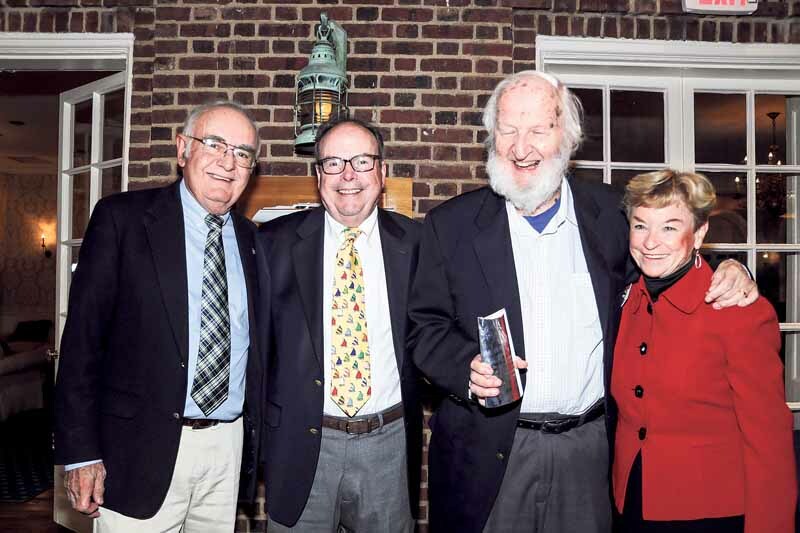 Bill Palafox, Richard Raskin and Bob Ebenau, representing the Race Management Committee, gave out the awards for the 2017 club races and for the two club regattas, the Day Race and the Moonlight Regatta. Membership recognition awards included: Service Award (for keeping the launch running): Bruce Logan and Roger Lifson; Cruising Award: Ron Gold; Extra Ordinary Achievement Award (for the Boat Share Progacht ram): Bill Palafox, Ben Shapiro and Richard Raskin and Extra Ordinary Achievement Award (Junior Sailing Program): Linda Kulla. 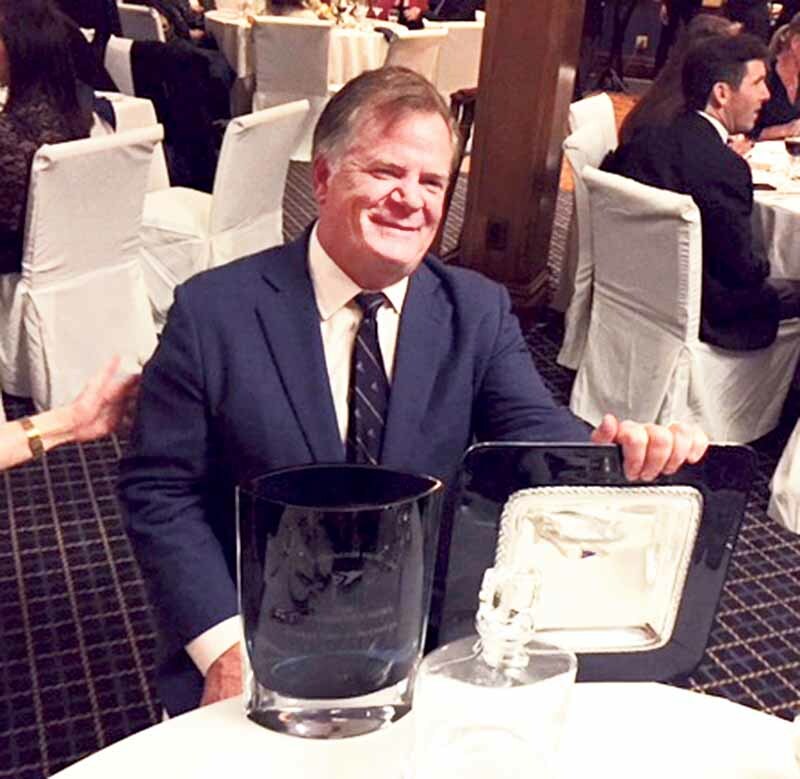 “Archie Bumper” Award (Race Committee inaccuracies): Bob Ebenau; Oscar for “Best Picture” (for North Shore Yacht Club 2017 Movie): Judy Raskin; Moosehead Award Fourth Class (for NSYacht Club Race Instructions considered too simple): to the Race Committee. The club has promised that the plaque from the Moosehead Committee will reside in a prominent place at the club. Successful North Shore Yacht Club racers also received trophies: Bob Ebenau/En Passant, Paul Meilink/Sounion, and Michael Didriksen/Calliope Girl. Roy Israel/Dybbuk, Bill & Mary Lu Palafox/Old Flame, Joel Ziev/Sundance. Marc Epstein/Vision. Richard Raskin/Osprey. Port Washington Yacht Club presents their Sailing Awards at their Decommissioning Ceremony. 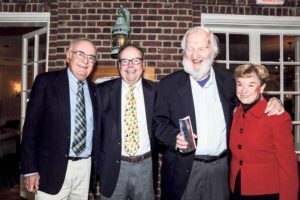 The winners of the 2017 yachting awards: Everett B. Morris Memorial Trophy (club member who has made the greatest contribution to yachting): Dawn Serignese; Martin F. Stein P.I.C.A Participation in Club Activities Award (couple who contributes the most to the club activities during the year): William and Eileen Neville; Sou’Wester Bowl (for a non-junior son or daughter of a member residing at home for outstanding performance in season’s racing): Katarina Catallo; Mayero Race Committee Award (awarded to race committee member or members exhibited a level of excellence in regatta management): George Catallo; Edward I duMoulin Memorial Trophy (club member who has made the greatest contribution to the advancement of Junior Sailing): Dr. Daniel Griffin; Commodore’s Bowl (best competitive performance by a Port Washington Yacht Club skipper): George “Chuck” McCarthy; Rainbow Bowl (Port Washington Yacht Club skipper with best performance in officially sanctioned distance races of the YRALIS (Yacht Racing Association of Long Island Sound): George “Chuck” McCarthy; Buccaneer Trophy (Port Washington Yacht Club yacht with lowest corrected time overall in the Annual YRA Day Race): George “Chuck McCarthy. Upcoming Events: Thursday, Feb. 15, 1930 hours, North Shore Yacht Club: Block Island Race Week 2018 by Block Island Race Committee, Roundtable Discussion, Cruising to Block Island. 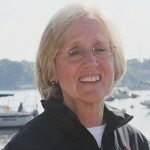 Sunday, March 11, 1600 hours, North Shore Yacht Club: Gary Jobson film encouraging women sailors with an introduction by Dawn Riley.